Ducati is revolutionising its motorcycles after announcing that it is developing a new state of the art ARAS radar system in its bikes. Safety is a continuous concern for bikers. After finalising the ARAS radar system, the company will have successfully taken one of the most discussed topics in the motorcycling world and turned it into one of the biggest selling points. After all, who doesn’t want to ride a radar-equipped wheeled rocket? But what exactly does this ARAS radar system do? The Advanced Rider Assistance Systems (ARAS) uses sensors in both the front and the back of the motorcycle to warn riders of potential dangers that may exist on the road. It does this by using an advanced user interface and alerting riders of possible dangers in areas such as blind spots. A blind spot is commonly used to refer to the section of the road not seen in the wing mirrors by the rider. Not checking this area is often attributed to many road collisions. Actually, Yes! The front-facing radar itself is something to be excited about! 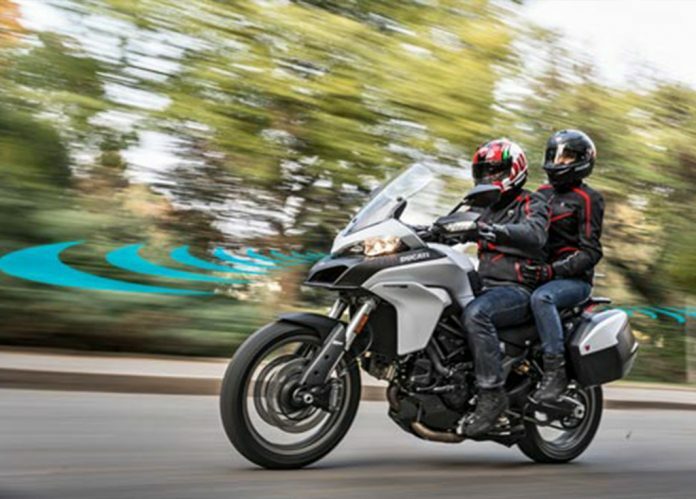 Ducati announced that the system would sense vehicles in the front of your bike which will be instrumental in adaptive cruise control. This effectively means the system will allow riders to follow other vehicles at a safe distance with the convenience of an easy ride. Life has just become a lot safer and easier to be on the road. But why have Ducati decided to put radars in motorcycles? Motorcycle deaths and injuries are constantly on the rise and motorcycle sales appear to fall every year. It’s clear that consumers want the same need for speed without the fatalities. Ducati made the decision to address new safety procedures as part of its ‘Safety Road Map 2025’. The first step of which, is to implement ABS as standard in all their new motorcycles. ABS is an electronic braking system allowing bikers to use full braking control even when cornering. The company additionally looked into the idea of motorcycle airbags which interacted with the motorcycle in 2014. Once the vehicle detected a crash using sensors, the airbag would deploy ensuring maximum safety for the rider. Do you not think that bike companies are removing the skills necessary to be a biker? When new technology is implemented in the motorcycling industry, it’s always a controversial topic with bikers. Whilst the prospects of a semi-autonomous bike is highly attractive, many argue that the industry is removing the skill and passion that comes with owning a motorcycle. However, it doesn’t seem that long ago when Kawasaki debuted its fuel injected motorcycles back in the 1980’s. The systems didn’t reach full popularity until the early 2000’s. Today many bike owners today couldn’t imagine the prospect of nostalgically having to choke your bike and warm up your engine in the early winter mornings. Whether you’re a moto-tech enthusiast or prefer the good old days, one thing is for certain. The motorcycle industry is changing and the bikes you’ve come to know and love will soon be a thing of the past. Perhaps you remember a time when other new types of technology were implemented into bikes? Don’t forget to tell us which you prefer by dropping us a comment below!